Stocks closed slightly higher in choppy trading Wednesday as Wall Street tried to interpret a release from the Federal Reserve which summarized its crucial meeting last month where the central bank indicated it would be patient on future rate hikes. The Nasdaq Composite ended the day just above the flatline at 7,489.07 to notch its eight consecutive gain. The Dow Jones Industrial Average rose 63.12 points to 25,954.44. The S&P 500 closed 0.2 percent higher at 2,784.70. Equities gyrated following the Fed's release, with the S&P 500 and Dow reaching their highs of the day. The Fed meeting minutes highlighted downside risks to the economy from its January meeting, including "the possibilities of a sharper-than-expected slowdown in global economic growth, particularly in China and Europe, a rapid waning of fiscal policy stimulus, or a further tightening of financial market conditions." "Slowing growth has been a low humming chorus in the market for a while now and today we're hearing the Fed join in, which is a significant departure from the goldilocks rhetoric we've heard from them in the past," said Mike Loewengart, vice president of investment strategy at E-Trade. "That said, slow growth does not mean recession." However, some equity investors may be encouraged by language in the minutes regarding its hotly debated balance sheet normalization. Bulls want the Fed to stop reducing its balance sheet, arguing that practice is a de facto tightening of monetary conditions. The central bank did hint in the minutes that it may end its balance-sheet normalization this year. "Almost all participants thought that it would be desirable to announce before too long a plan to stop reducing the Federal Reserve's asset holdings later this year," the minutes stated. 'Such an announcement would provide more certainty about the process for completing the normalization of the size of the Federal Reserve's balance sheet." Traders work on the floor of the New York Stock Exchange (NYSE) as the Federal Reserve Board Chairman Jerome Powell holds a news conference on December 19, 2018 in New York City. The U.S. dollar hit its session low after the minutes were released, but later recovered to trade around breakeven. The Cboe Volatility Index (VIX), considered the best gauge of fear in the market, was down 5.7 percent around 14. On Jan. 30, the Fed it will be "patient" in tightening monetary policy moving forward and kept interest rates unchanged. Stocks have been on a tear lately in part because of the Fed's perceived pause on rate hikes. The Dow and Nasdaq are riding an eight-week winning streak, while the S&P 500 is up seven of the past eight weeks. Since the Fed's meeting in January, the major indexes are all up more than 4 percent. Investors are also watching out for developments on U.S.-China trade talks as officials launched a new round of negotiations on Tuesday. A follow-up session of higher-level talks is expected later in the week, as both sides look to resolve the long-running trade war before an early March deadline. "We think part of the recovery in share prices is with the suggestion that we've seen progress in [trade] talks," said Eric Wiegand, senior portfolio manager at U.S. Bank Wealth Management. "To sustain this, we need to actually see policy and not just progress." President Donald Trump has suggested he might extend the deadline for a deal, telling reporters in the Oval Office on Tuesday that March 1 was not a "magical date." An extension to the current deadline would prevent an immediate increase in tariffs on $200 billion worth of Chinese imports to 25 percent from 10 percent. But while stocks are up sharply, Treasury yields have also fallen sharply. The benchmark 10-year note yield traded around 2.78 percent on Jan 18. On Wednesday, it hovered around 2.65 percent. 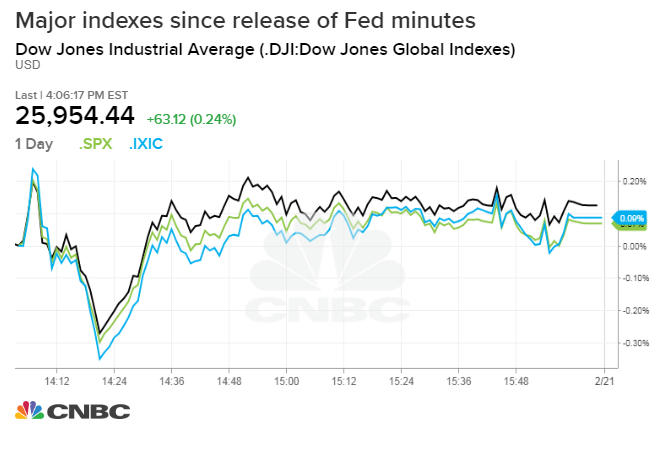 "The stock market reads that the Fed is going to ease off on where they thought they were going with interest rates and perhaps holding on to more of their balance sheet, all of which was interpreted as good news," said Dave Campbell, principal at BOS. "Bond investors are looking at the exact same data and say the Fed is acknowledging the risks out there by slowing down." CVS Health shares fell more than 8 percent after issuing a weaker-than-expected earnings forecast for 2019. The company's guidance comes after closing a $70 billion deal to acquire health insurer Aetna in November. Southwest airlines fell 5.65 percent after slashing its revenue guidance. The company said the recent U.S. government shutdown cost it $60 million in sales.